Let’s get ready to write! 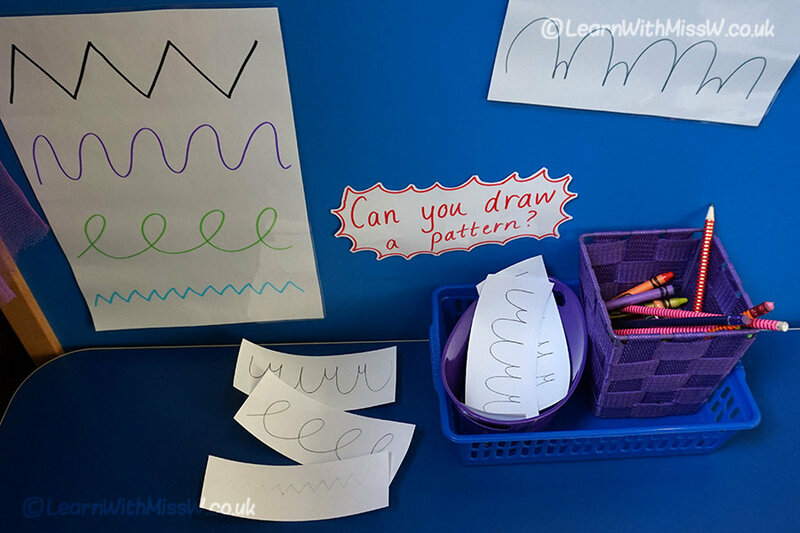 This week the writing table has no letter formation, we’re developing pre-writing skills by drawing patterns. Children have the opportunity to mark make and use the muscles needed for writing. I’ve photocopied my examples and reduced the size for the children to draw over and there’s blank paper for their own designs. There are various pencils and crayons to try out. I’ve not put out whiteboards and pens for this activity as these do not give enough resistance. This afternoon we also had some fun spreading paint with ink rollers. I’ve never used these before, but they’re meant to be good for building shoulder muscles, which helps with writing. I printed some big raindrop outlines on A4 paper, we rolled out the colour on the other side and when it’s dry, the children will hopefully be able to cut it out. I’m trying to handwrite environmental print such as signs instead of typing and printing to show the importance of learning to form letters correctly.